Sorrento has developed a reputation for being a seaside resort without any good beaches. It is true that near the centre of town there is only Peter’s Beach, a small strip of sand, which can be used by the public, although many of the big hotels have their own tiny areas of beach. But there are some great places for swimming and sunbathing just out of town if you know where to look. A lovely beach with an expanse of sand that is free to use can be found at the old fishing village of Marina di Puolo, south of Sorrento and just a little further along the peninsula from Villa Pollio and the Baths of Queen Joan at Punta del Capo. Turn off Via Capo down Calata Puolo and then turn left again to go down some gradual steps and along a narrow path past olive groves and a vineyard until you reach the intersection with Via Marina di Puolo. You will pass a car park (the nearest point to the beach that you can drive to if you come from the main road) before going down a steeply descending, zig-zagging path to reach Marina di Puolo. 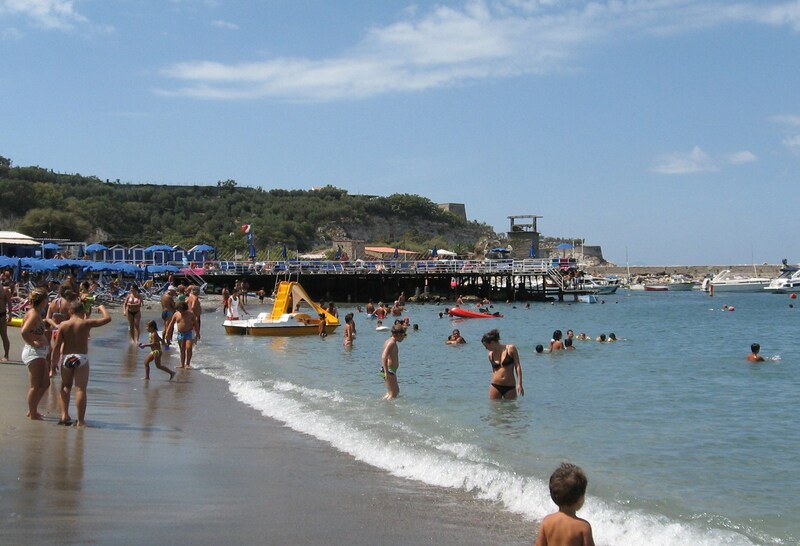 What does Marina di Puolo have to offer? You will find a shop, a few restaurants and a hotel with its own private area of the beach when you get down there. However, there is a good sized stretch of the grey, volcanic sand open to the public. You can hire sunbeds, deckchairs and umbrellas from Angelo, the resident bagnino, who can usually be found near the restaurant Raphael. Angelo and his helpful staff provide excellent customer service and keep the beach in good order. When you enter the sea, it is shallow for several metres and you can wade out quite a long way before you begin to get out of your depth. Once you have crossed an area that is rather pebbly, you will find it is soft under foot and the water is pleasant for bathing. There is a substantial area for safe swimming, separated by a rope from the moored boats. 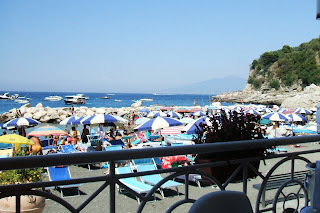 After your swim you will enjoy having lunch outside one of the restaurants along the sea front enjoying the view while you sample the delicious fresh fish and the local wine. You can see Vesuvius and the coastline across the bay. To the right is the rocky end of Punta del Capo and to the left there is a promontory of land known as Capo di Massa, which is surmounted by the remains of a 16th century look-out tower. 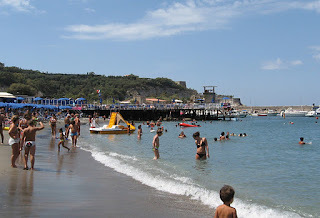 Marina di Puolo can be crowded on Saturdays and Sundays during the summer, when many Italian families head for the beach. But on weekdays it is a pleasant place to escape to. 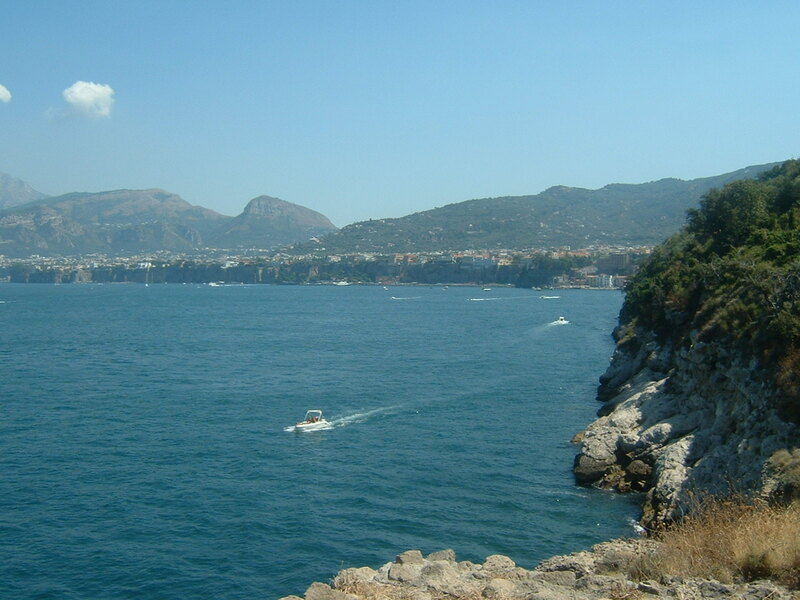 To see stunning views in different directions across the Bay of Naples visit the point of land protruding from the Sorrento peninsula known as Punta del Capo. Many wealthy Romans built holiday villas on the panoramic points along the Sorrento coast and so it is not surprising that there are the extensive remains of a first century Roman villa on Punta del Capo. You can explore the ruins at any time of the day free of charge and you will also find that it is good spot for photography. It is well worth taking pictures of your family or holiday companions with the unique backdrop of the sweeping view over the Bay of Naples. Leave Sorrento along Via del Capo in the direction of Massa Lubrense. You could walk, taking in the view over Marina Grande along the way, but it is uphill and can be hard work in hot weather. 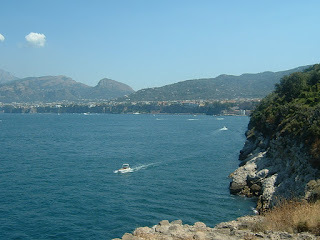 Or you could take the Linea A (Line A) orange bus to Capo di Sorrento from Piazza Tasso, which takes about ten minutes. 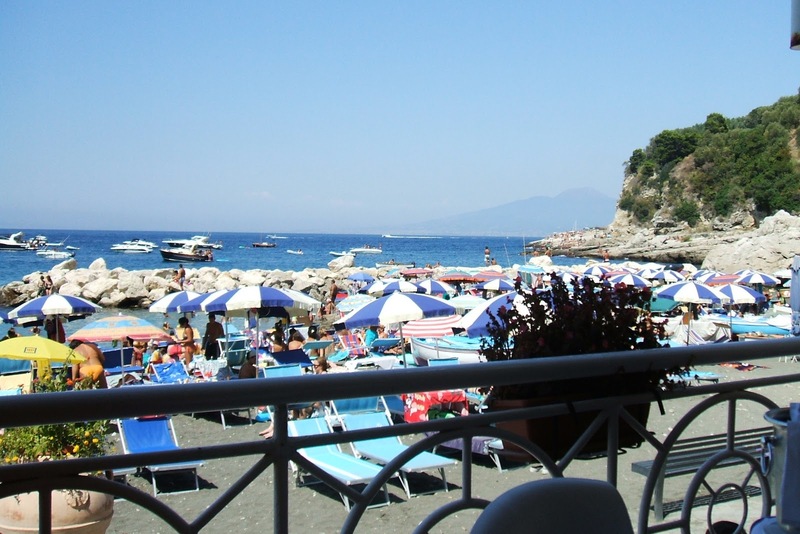 Get off at the small hamlet of Capo di Sorrento, where there are a few shops and a bar. You will see a signpost pointing to i ruderi romani (Roman ruins). It is a pleasant walk down to the sea along Via Punta Capo past the church of San Rosario. 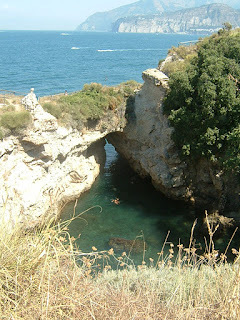 You will come first to a natural triangular pool with an archway of rock over it which is known as il Bagno della Regina Giovanna (Queen Joan’s bath). The clear shimmering water in the pool attracts swimmers and snorkellers in the summer. 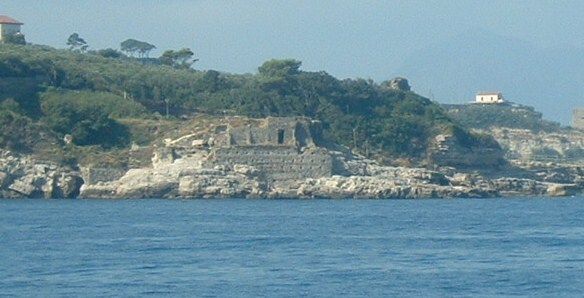 On the tip of Punta del Capo are the ruins of a large Roman villa which would once have had grand rooms from which the panoramic views of the bay could be enjoyed. The villa would also have had access from the sea for visitors arriving by boat. Many people believe that the villa was built by wealthy Roman citizen Pollio Felice and that the ruins are of the magnificent holiday home described in the writings of both Horace and the poet Stazio. Pollio Felice was a learned historian, orator and poet who founded a library in Rome and was the protector of Virgil and Horace. Queen Joan’s bath may have once been the swimming pool for the villa and it is thought there were also some beautiful gardens and a vineyard. Another school of thought is that the villa referred to by Horace and Stazio was actually located at nearby Marina di Puolo, a small beach further along the coast, and that the extensive buildings on Punta del Capo belonged to someone else. The beautiful natural pool may have acquired its name because a 14th century Queen of Naples named Giovanna (Joan) was known to have frequented the spot with her ladies in waiting for bathing. Giovanna was famous both for her beauty and her cruelty towards her subjects and it is believed she came to a violent end, strangled by her nephew. Both visitors to Sorrento and local residents will have attended church services before sitting down to the festive meal and toasting the new year with a glass of good prosecco. Buon Anno e Tanti Auguri per 2012 da Best of Sorrento!